While I grew up eating recipes out of cookbooks published by the Moosewood Collective, books which later became my vegetarian bibles and first sources for nutritional information, I haven't read a lot of literature related to foodie and food politics issues, so this year I'm hoping to buff up my library and become a better-read food activist. The following list includes some books I've read along with some books I'm looking forward to reading in the new year. If you have any suggestions or additions to this list, I would love to hear them, especially French authors, who are lacking in this list. In any case, here's a start and if any of these titles seem like possible pleasers as presents, I encourage you to track them down and support the work and research done by these authors. Aside from my utter disgust with shopping in depressing supermarkets, I credit my interest in, and the fun and factual basis of my introduction to, food culture to two books; Sandor Ellix Katz's Wild Fermentation and Michael Pollan's In Defense of Food. 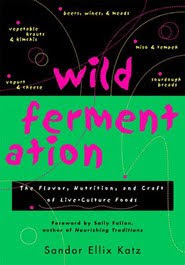 I looked at several books on fermentation before I picked up Katz's, which I chose because of the author's clear passion, exhaustive knowledge, and enthusiastic interest in the subject matter. The book includes recipes for fermented favorites like sauerkraut, kimchi, pickles, bread, and yogurt, along with guides to brewing your own beers, wines, and meads. With it's illustrations and simple, unintimidating instructions, this book is the only guide you'll need to turn your kitchen into a bubbly, briney, lab of wonders. Fermenting is fun, easy, and addictive, anyone that you turn on to this awesome form of food production will thank you for years afterwards. Katz has also published a book called The Revolution Will Not Be Microwaved which tells the story of various grassroots activists and their methods of fighting against the industrial food machine. I haven't read this yet, but it's on my list! 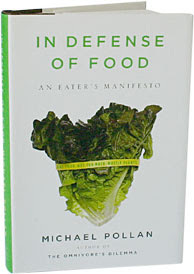 Michael Pollan's work is well known, with In Defense of Food existing as a volume among his many publications on the subject of Big Food and the politics of what we are sold and eat in America. 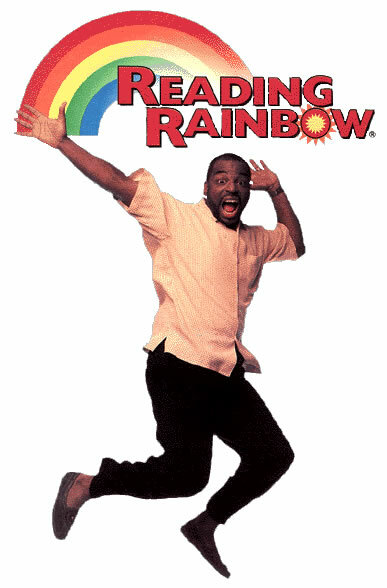 Other titles include The Ominivore's Dilemma and Food Rules: An Eater's Manual. These books offer simple and manageable guidelines for understanding the affect that what we eat has on our bodies as well as the world around us. I devoured (bookavore?) In Defense of Food and am looking forward to reading his other work. Michael Pollan can also been seen in the documentary Food, Inc. , which is less cheery to watch than The Grinch this Christmas season, but has a moral that is definately worth internalizing during this festive, foody season. I suggest you organize a viewing and revolutionize they way you and those around you think about what you eat (and where it comes from). Other books on my "To Read" list include Food Not Lawns by H.C Flores, which is published by Chelsea Green Publishing, which has published Katz's titles among other books addressing the subject of sustainable living and food politics. Food Not Lawns offers a guide to turning "your yard into a garden and your neighborhood into a community". Keeping with the principles of Paris Paysanne, the book advocates leaving no space untended and no garden unrealized. A classic of American literature and journalistic muckraking, The Jungle by Upton Sinclair never made it on my list of required reading in highschool, so I'm adding it now. The insight this book offers into American slaughterhouses is very à propos given the American governments current botching of attempts to pass food safety legislation. If Harry Reid and other members of the House and Senate had this book on their nightstand, I think the food regulation and inspection bill S510 would've been more rigorously written and then subsequently happily and swiftly accepted into law. Probably voted most likely to blow something up to defend his principles in high school, Derrick Jensen is a passionate, eloquent, and educated environmental activist. After hearing him interviewed on Democracy Now!, I was inspired to get my hands on Jensen's complete works, which include books such as Listening to the Land, A Language Older than Words, Endgame, and Resistance Against Empire. If anyone is familiar with these books or any others by Derrick Jensen, I would love some advice on where to start. Pour les francophones petits et grands, j'en ai deux idées des livres à lire sans hésiter. Le premier, Pour sauver la planète, sortez du capitalisme par Hervé Kempf, annonce la nécessité de mettre à fin le règne de deux cents ans du capitalisme- que l'auteur accuse d'être la menace le plus destructif pour l'environnement. Kempf, qui a aussi écrit Comment les riches détruisent la planète, encourage une réflexion sur le péril pour la planète ainsi qu'une revolution économique. Le deuxième livre m'a été suggéré par une amie, il s'agit d'un livre d'enfants qui s'appelle Planète écolo: Le grand livre des activités écologiques. Ce livre à la fois ludique et pédagogique propose aux enfants plusieurs activités qui les apprennent des leçons importants sur l'écologie, c'est à dire, qu'est ce-que c'est les OGM, d'où vient nos sources d'énergie d'où est ce-qu'ils vont venir dans l'avenir, et, la plus importante, qu'est ce-que l'on peut faire pour l'environnement dans notre vie quotidienne. You can also check out Homegrown.org's list of holiday selections for some great ideas for practical books to help in the garden and kitchen as well as Democracy Now! 's bookstore for a treasure trove of stories of grassroots organizing, speaking truth to power, and Standing Up to the Madness.